Pellicano Construction was honored to attend the WALB-TV ribbon cutting held on November 15th. 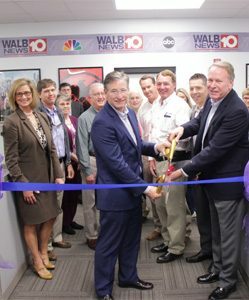 Pellicano recently completed an extensive interior renovation to WALB-TV comprised of approximately 9,200 square feet of existing office space. In order to minimize disruptions of day to day operations, the project was divided into three separate phases and was completed in just under 6 months. Please see the attached article for additional story.